and during special weekend events during the Spring & Summer months. The Mall galleries will again be hosting an exhibition of paintings by leading female artists. Anne will again be exhibiting a selection of her latest work at this prestigious event on the London art calendar. As an elected member, there will be a collection of 6 paintings featuring scenes of Havana, on display at Mall Galleries London SW1. One of the paintings (Home of the Mojito) was inspired by a visit to La Bodeguita del Medio, a frequent haunt of the famous writer Ernest Hemingway. The bar is a must for visitors to Havana wanting to experience the city’s decadent past, sample a mojito, and study the names that have been carved into the woodwork over many years. Anne completed another course last week at Dedham Hall, located in the beautiful Dedham Vale on the Essex/Suffolk border. The course concentrated on water based painting techniques. All the students expressed their appreciation of the direction and knowledge imparted by Anne, and an enjoyable and successful week was had by all. Anne will be tutoring a 4day course exploring the quality and excitement that can be achieved through water based medium, concentrating on interiors as subjects. This residential course will be held at DEDHAM HALL, situated in the heart of Constable Country in the beautiful Dedham Vale. A perfect village location with generous permanent studio facilities, in a comfortable hotel, serving excellent food - what more does an artist need? The Mall Galleries will again be hosting an exhibition of paintings by leading women artists. For 157 years, the SWA has pioneered the opportunity for women artists to exhibit their works at major art venues. Naomi Tydeman Gallery Tenby Pembrokeshire. An annual exhibition of works by selected artists living and working throughout Hertfordshire. Crowbridge Hall Hertford. As part of the exhibition programme, Anne spent a day at the Mall Gallery demonstrating painting techniques in watercolours. The day took the form of live demonstration, question & answer sessions and general discussions with many enthusiastic groups of exhibition visitors and keen artists . Anne’s knowledge and tutoring skills ( see below DEDHAM HALL) hopefully helped to shed some light on this most elusive of mediums. The exhibition will once again be held at The Mall Galleries London SW1. As an elected member of the RI, Anne will be showing a collection of 6 new works at this prestigious event. As part of the show’s programme, Anne will also be demonstrating water colour techniques at the exhibition on Friday 13th April. A programme of education forming part of the Queen’s Patrons Award scheme. Anne will be tutoring young invited artists from London based schools to promote skills and techniques in painting with watercolours. These sessions will be held at The Learning Centre in The Mall Galleries. Following a very successful Spring event, Anne is holding another RI workshop at The Mall Galleries on Sat. 25th November. The subject is: ‘Water based mediums’ - How to handle and experiment with Watercolour , Gouache and Acrylic. For more details click on Contact and head your message RI workshop. 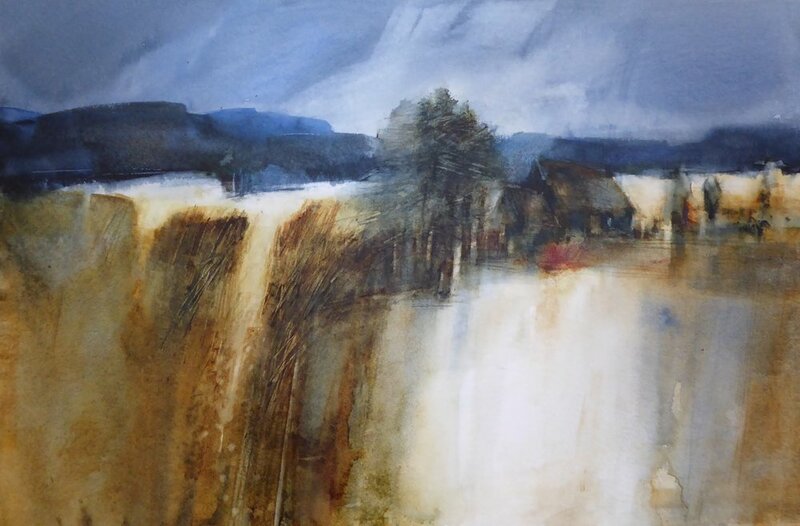 Anne will be joining over 20 other RI members showing their work at this stunning exhibition of contemporary watercolours, illustrating just how radical this art form can be. A return to The Mall Galleries for the SWA exhibition. A society engaged in pioneering the opportunity for women artists to exhibit work at major art venues. Paintings covering a variety of subjects are again on show at this well established annual event which has resulted in a number of accolades for Anne’s work (See Profile page). Another major show held at The Mall Galleries London. As an elected member of the RI, Anne’s work was again featured as part of this annual prestigious exhibition. A permanent showcase of Anne’s work now at the gallery in the village of Stansted Mountfitchet CM24 8HD. Please request details of opening times in the CONTACT pages. Anne held a very successful RI workshop at the Mall Galleries London. A series of workshops are held each Spring & Autumn to promote painting in water based mediums. exhibition called SPLASH being held at The Mall Galleries 8th - 13th Nov. An opportunity to purchase and/or place silent bids in the auction of paintings, with proceeds going to the RI’s programme of education in art.